As policymakers gear up to address rising drug costs, a new report highlights just how much prices have gone up in recent years. The prices of some of the most popular brand-name drugs have increased by 12% on average each year from 2012 to 2017, based on Medicare Part D data, according to a report released by Sen. Claire McCaskill, D-Mo. That's 10 times greater than the rate of inflation during that same period. Though the number of these prescriptions decreased by 48 million in that window, profits increased by $8.5 billion. Twelve of the 20 medications included in McCaskill's report saw prices increase by 50% between 2012 and 2017. For six drugs, prices increased by more than 100% during that period. "Can you imagine if you went to an auto dealership and last year's exact model was being sold at a 20% markup, and then you went back the next year and it had happened again?" McCaskill said in a statement. "That's exactly what's happening in the prescription drug industry, where the cost of identical drugs skyrockets year after year." McCaskill's report comes as the Trump administration is planning a multi-pronged approach to lower the drug costs. During his State of the Union address, President Donald Trump said controlling drug costs is a major goal for his administration in the coming year. The White House's plan includes pushing pharmacy benefit managers to share rebates directly with members, an issue that has been a matter of contention between payers and pharmaceutical companies. Payers take the savings from rebates and apply them across the board to lower premiums, though copays are based on a drug's list price, not the price after rebates. Drugmakers have deflected blame for rising drug costs by pointing a finger at PBMs. The administration's plan for drug prices, which was compiled by the Council of Economic Advisers, also suggests that some generic drugs should be offered for free and takes aim at "free-riding" abroad, where countries that have single-payer health systems purchase drugs at a low price, leading pharmaceutical companies to jack up the price for patients in the U.S.
Increasing profits, these companies argue, is crucial to funding additional drug research and development. Some experts said that the administration's plan is unlikely to drive down costs. Critics have also been skeptical that Department of Health and Human Services Secretary Alex Azar, who headed Eli Lilly's U.S. operations, will lead the charge on drug prices. 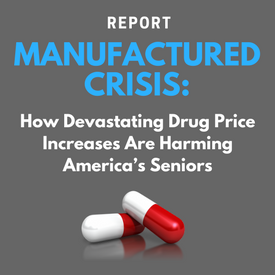 McCaskill's report notes that Medicare beneficiaries' spending on drugs is expected to continue to grow over the next several years. Prior research projects that that spending on medications will rise from 41% of per capita Social Security income to 50% by 2030. Drug prices are a major concern among healthcare executives, and a recent survey shows that 70% feel they may need to operate their own pharmacies to help control costs. Medicare Still Doesn't Cover Dental Care. And That Can Be a Big Problem. This is a good read on the lack of dental coverage provided by Medicare and the important role of a insurance agent to help keep beneficiaries covered. PSM offers an array of dental plans available to our agents along with the guidance on how to best incorporate into your business. Many people view Medicare as the gold standard of United States health coverage, and any attempt to cut it incurs the wrath of older Americans, a politically powerful group. But there are substantial coverage gaps in traditional Medicare. One of them is care for your teeth. Almost one in five adults of Medicare eligibility age (65 years old and older) have untreated cavities. The same proportion have lost all their teeth. Half of Medicare beneficiaries have some periodontal disease, or infection of structures around teeth, including the gums. Bacteria from such infections can circulate elsewhere in the body, contributing to other health problems such as heart disease and strokes. And yet traditional Medicare does not cover routine dental care, like checkups, cleanings, fillings, dentures and tooth extraction. Paying for dental care out of pocket is hard for many Medicare beneficiaries. Half have annual incomes below $23,000 per year. Those who have the means, but are looking for a deal, might travel abroad for cheaper dental care. Tens of thousands of Americans go to Mexico every year for dental work at lower prices. Many others travel the globe for care. 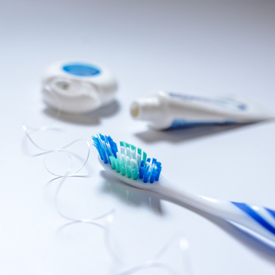 Although low-income Medicare beneficiaries can also qualify for Medicaid, that’s of little help for those living in states with gaps in Medicaid dental coverage. According to a study published in Health Affairs, in a given year, three-quarters of low-income Medicare beneficiaries do not receive any dental care at all. Among higher-income beneficiaries, the figure is about one-quarter. Traditional Medicare will cover dental procedures that are integral to other covered services. So if your Medicare-covered hospital procedure involved dental structures in some way, important related dental care would be covered. But paying for any other care is up to the patient. Lack of dental coverage by Medicare is among the top concerns of beneficiaries. The program also lacks coverage for hearing, vision or long-term care services. However, many Medicare Advantage plans — private alternatives to the traditional program — cover these services. For example, 58 percent of Medicare Advantage enrollees have coverage for dental exams. In receiving these benefits through private plans, enrollees are also subject to plans’ efforts to limit use by, for example, requiring prior authorization or offering narrow networks of providers. These restrictions can be problematic for some beneficiaries, and about two-thirds of Medicare beneficiaries opt for the traditional program, not a private plan. Adding a dental benefit to Medicare is popular. A Families USA survey of likely voters found that the vast majority (86 percent) of likely voters support doing so. The survey also found that when people do not see a dentist, the top reason is cost. Ms. Willink’s study estimated that a Medicare dental benefit that covered three-quarters of the cost of care would increase Medicare premiums by $7 per month, or about 5 percent. The rest would need to be financed by taxes. The cost of such a benefit might be offset — or partly offset — by reductions in other health care spending, reflecting the fact that poor oral health contributes to other health problems. Making a case for this in the political arena would not be easy, though. The initial cost would be an inviting target for politicians who express concern about fiscal prudence, regardless of any potential long-term gain. But expanding Medicare has been done before. In 2006, a prescription drug benefit was added to the program. The law for that program was enacted in 2003, and in that same year, the surgeon general released a report calling for dental care to be treated and covered like other health care. Whether by Medicaid or Medicare, that wish is still unfulfilled. Over 90% of adults over 50 own a computer or laptop, 70% have a smartphone, and over 40% own a tablet, according to a national study of 1,520 adults conducted in November. Adults 70+ are more likely to have more dated technology, such as desktops and feature phones, than those age 50-69. Want to know what the grandkids are doing? Check on Facebook. Sure enough, across all devices, over seven in ten adults 50+ are on social media, and nine in ten (91%) of those with devices say they use technology to stay in touch with friends and family. Smartphones help people be social while they are on the go. Over half of smartphone owners use a social app weekly. Texting (86%) has caught up to email (87%) as the top ways people use technology to communicate with others. Among adults 50+, nine in ten say they use their smartphone to send instant messages, texts or emails, and over three quarters find them handy for getting directions or traffic information. They also use them for purchasing apps, surfing the internet, getting news, and accessing social media, the AARP research found. Just how adults use technology varies by age. Adults 50-59 are more likely to do banking activities and watch video on their smartphones than those who are over 60. However, smartphone users age 60-69 are leading the way in using their phone to manage medical care (they are significantly more likely to do so than those over 70: 33% vs. 21%). Respondents report using tablets more for entertainment and computers for practical tasks. Adults in their 50s and 60s use their computers to engage in online learning activities and posting ratings and reviews more frequently than those older. Further, Americans over 70 do fewer activities on their computers than those under 70, with a couple exceptions, including gaming (over half play games on their computer) and email. When it comes to wearable technology (smartwatches, fitness trackers, etc.) and home assistants, just a small percentage of the 50+ market are on board. Younger adults are more likely to own a wearable than those over 70. In spite of the reliance on technology in many realms of life, just 18% of adults 50+ are extremely or very confident in their online privacy. Four in ten (41%) are not very or not at all confident in their privacy. Those over 70 are more skeptical their information is private online than those aged 60-69, the survey finds. Most older adults do not completely trust companies to keep their data secure. The survey discovered respondents have more confidence in banks and health care organizations and less trust toward the media, social media sites, and membership organizations. Despite security concerns, however, the survey found many older adults don’t take proactive steps to protect themselves (although men are more likely to do so in several instances). Overall, just 58% of respondents say they use a passcode to lock their tablets and 59% use one on their smartphones. And changing passwords every few months? Just 45 percent of adults 50 and over take that security precaution. Few older adults have used virtual reality, and many are unfamiliar with augmented reality. Most respondents had heard of virtual reality devices but few have tried them. Adults age 50-59 are the most likely to have checked out or own a virtual reality device, but adoption is still small. Over six in ten adults in the survey have never heard of augmented reality and very few have tried it -- although awareness was greater among those in their 50s. This study was fielded from November 16-27, 2017 using GfK’s KnowledgePanel, a probability based web panel designed to be representative of the adult US population. Respondents needed to be age 50 or older to complete the survey. Completion rate was 59.9% and resulted in a total sample of 1,520. The data are weighted by age within gender, education, race/ethnicity, household income, language preferences, and Census division to reflect US adults age 50 or older. For more information contact G. Oscar Anderson at GAnderson@aarp.org. At PSM, we provide the tools, knowledge and support to help take your business to new levels. If you have an interest on how to effectively sell online, we would love to assist you. If you sell Medicare products and you have a website, this is an insightful on how to effectively market your business. We live in a digital world. The signs of people’s ever-increasing passion for digital communications are all around us. Digital has become woven into everyday life, yet, most Medicare Agencies don't have a sound digital marketing strategy. KERN Health’s informal polls at the Medicare Marketing & Sales Summits in Orlando and Nashville suggest that most (65%) of Medicare Agencies felt that their organizations were struggling and were unprepared to develop a digital marketing strategy. According to Pew Research Center, 76% of older (leading-edge) Boomers (ages 60–69) use the Internet daily. 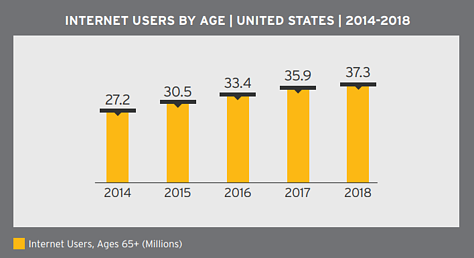 Even the Silent generation (ages 70–87) now has an adoption rate of 61% who use the Internet. And when we look at the younger (trailing-edge) Boomers (ages 51–59), we see the handwriting on the wall for the future of Medicare marketing—with only 17% of this group not using the Internet daily. Furthermore, 84.9% of Boomers and Medicare beneficiaries are sharing information, talking about politics and engaging on Facebook. So think digitally. Because your competitors already are. Up until now, some brave Medicare Agencies have dared to peel a portion of the budget away from the traditional workhorse channel of direct mail to experiment with digital, but they’ve done so in very limited ways. 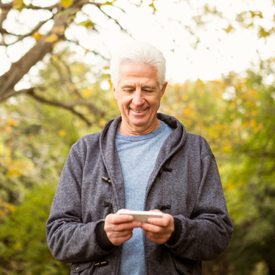 When you understand just how much Boomers and Medicare beneficiaries are utilizing digital channels, you’ll see why there’s the urgent need to do more. And when we’re speaking about digital, more than half of what we’re speaking about is mobile. According to a 2016 Pew Research Center report, mobile now accounts for more than half of all digital advertising spending, while digital ad spending grew from $43 billion in 2013 to over $60 billion just two short years later. 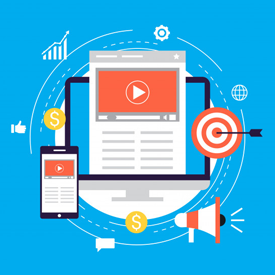 Hopefully this guide will provide insight and best practices on how to make sure your website and marketing efforts are optimized in the new digital age of the senior market.